Not only weekly fresh foods or meats are on sale but Coles Catalogue also provides a price range for packaged-foods and fridge products. You can boost up the speed of preparing the dinner or lunch with simple meals like Steggles chicken breast tenders which is another half-price deal on the latest catalogue. Buy ice cream or frozen foods at Coles at cheaper prices. Peters Connoisseur ice cream of 1L will cost only $6 and you'll save $2.40 on that item. If you like pizza you don't need to order. Instead, stock up frozen pizzas like McCain pizza singles or Dr. Oetker Ristorante in your freezer. Grab them whenever you want to suppress your hunger in just minutes. 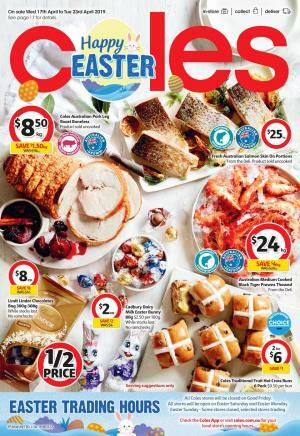 Easter sales are almost traditional values of all weekly catalogues that are similar to Coles. Cadbury is one of the most popular brands that we encounter frequently in Easter sales in these contents. For example, Cadbury ultimate Easter share pack will cost only $5/ save $3! There is also a half-price sale in this part of the catalogue. Discover the new flavours like Red Rock Deli Potato chips special reserve and only pay $3! Have your refreshing favourite sodas at Coles. A Coles special is the new Schweppes signature soft drink priced at $4.50. More soda packs including Pepsi 1893 original Cola is also available on pg 22-23. Browse more categories like soft drinks in this catalogue. More pages than usual are available for them. Easter deals are also available on Coca-Cola, Pepsi, Solo, Schweppes, V8, and more beverages. See more chocolate deals on pg 26. Lindt Lindor chocolate bag costs $8 this week. Pantry range of Coles is also helpful for customers who seek a good deal on foods. Check out half prices of Campbell's chunky soup and MasterFoods simmer sauce. 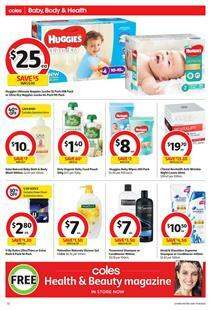 Coles Catalogue offers new grocery deals, snacks, beverage, half-price deals, fresh produce, seafood, and many more categories of weekly supplies of food. Restock your favorite breakfast foods and snacks with the prices from Coles Catalogue. Buy canned foods and sauces to make your meals excitingly delicious. They will also smell the best version of them. Patak's simmer sauce of 450g can is only $2.25, which is a half price. Check out for quick foods for your breakfasts. One of the most popular ones is belVita breakfast biscuits. Pay only $2 and find it on the half-price range on pg 2-3. If you are seeking out a deal on cleaning supplies to handle the defects of the details of your house, you might want to view the ones on pg 5. The latest Coles Catalogue offers multi-purpose cleaning chemicals, laundry detergents, and dishwashing liquids of the top brands. Morning Fresh dishwashing liquid will cost $2.07 which is another half-price deal! Get your vitamins and minerals from the natural source. The fresh food is the best food to receive elementary substances like vitamins. Avocados, pears, apples, pumpkin, kale bunch, sliced mushrooms, and more are available in that range. Discover new recipes with Coles. You should see the traditional Easter foods. Hot cross buns cost only $3.50/pk. Browse the fresh-cut meat and deli. Find Seafood for Lent on pg 12-13. Dairy and fridge food like milk, block cheese, orange juice, and more are available on pg 14-17. Subscribe to the newsletter to get emails about the future catalogues or the current deals. Grocery sale consists of many categories including pantry, fresh produce, deli, bakery, seafood, and meat. More products are on sale, specials of Coles look cool and profitable. You have red Perino tomatoes, kids pack apples, sliced mushrooms, brown onions, Australian carrots, in the fresh produce section of the grocery sale of Coles. No added hormones beef rump steak will cost $20/kg at Coles. Coles Catalogue also shows the price range of deli meat and packaged products. For example, you have Bertocchi sopressa salami for only $23/kg. Seafood for Lent is one of the interesting parts of the latest catalogue. Never miss out a deal from the current Coles Catalogue, subscribe to get emails about the new ones. As Easter is approaching hot cross buns and other deli-bakery products are very popular among the catalogues. Anzac biscuits or cookies and traditional fruit hot cross buns are two great offers that are on sale. John West mackerel, oyster, salmon, and more canned seafood are also discount products. Snacks are also an important part of this sale. Brilliant ideas of snacks to stock up, favorite brands of chips, Cadbury chocolate bags, V Energy drink, Coke, and more are available in the snacks-drinks range of Coles Catalogue. You will also find breakfast products like Kellogg's Nutri-grain, Froot loops, Just Right on pg 21. One of my favourites from this range is Kellogg's coco pops. They are delicious with low-fat milk and I have no time concept to eat them. Get your ingredients ready for cooking this week. Coles sells amazing pantry products that are basically pasta sauce, MasterFoods squeezy tomato or BBQ sauce, Heinz chunky soup and more. Find nutritional shakes and protein food on pg 23. You might need them if you are thinking of doing some bulking or preserve the muscle structure of your body. Moreover, they are the perfect replacement for breakfast in case you want to lose some weight. By eating these, you will know exactly how many calories you get in the mornings. A big part of the latest Coles Catalogue has the half-price deals on snacks, pantry, breakfast, personal care, household products. View half-price deals on the spotlight on the first 5 pages. You will be able to buy Vanish stain remover powder for only $14! Check out the price of Palmolive dishwashing liquid of 700mL bottle on pg 5. Coles sells BIC hybrid4 for only $5 which is another half price. It's natural to come across with something you have been looking with a good price at Coles. The catalogue always has the best prices of the week for the product range of them. Have some of the best tea brands in your inventory for breakfast for only $1 this week at Coles. Customers of Coles can save a lot with the special half-price sale starting on Wednesday, however, you can also browse fresh produce, meat, whole chicken, deli meat, sausage, salami, Seafood for Lent, bakery Sourdough rolls, hot cross buns, John West canned fish variety, and more including recipes. Coles has one of the best supermarket product ranges. Special deals can also be a great chance for you to save more. V Energy Drink variety is on sale. Household Supplies are chemical cleaning products, Finish Quantum, air fresheners, dishwasher cleaners, and more on pg 5. I strongly recommend you to visit that page if you need to stock up some of those. Subscribe to the newsletter to get emails of the new posts and emails. Don't forget to see this catalogue and the other weekly specials.